From the moment Linda and I arrived at the Auriga Spa for an indulgent girlfriend adventure at Capella Pedregal in Cabo San Lucas, Mexico, we were transported to an oasis of peace and serenity. The 12,000 square foot spa is housed in a domed structure nestled in the center of this boutique resort that sits on the Pacific Ocean. We followed a curved path through manicured desert gardens lush with palms, grasses, succulent cacti, sand art and captivating turtle sculptures of metal. Of course, we were tempted to go “off-road” and wander but we had appointments to keep. And as a standard practice, non-resident guests at Capella Pedregal don’t wander here; a staff member accompanies them to their destination—whether it’s a restaurant or spa. After checking in and before being shown around the spa, we were invited to choose the indigenous scents we preferred for our massages. I selected an aromatic mix of citrus and vanilla. Then we were each assigned a staff member who led us behind a massive wooden door. The décor, elegant design, spaciousness and subdued lighting of the spa—along with its Moroccan-influenced theme—were stunning and conducive to slowing down and being in the present. This spa has done away with the conventional communal locker rooms that always feel a bit awkward. Instead, we were each assigned to one of the private, red-draped dressing rooms that lined both sides of the wall. In lieu of lockers, mahogany armoires held plush robes and slippers we exchanged for our street clothes. The spa’s four signature treatments, all of which use natural organic products, are named for different phases and energies of the lunar cycle: New, Waxing, Full and Waning Moons. Our treatments started with a gentle sugar foot scrub and herb massage ritual in a circular room set up with foot basins and nooks for seating. Then Linda and I made our way through the female side of the water circuit, which included steam, sauna, and ice rooms (with fragrant orange slices) and a whirlpool. Throughout our journey, every staff member made sure we felt pampered and well taken care of. Someone was always around to help or direct but we never felt rushed or hovered over. When I mentioned that one of my fingernails broke, one of the technicians kindly rushed over with an emery board. For our full body massages, we were each led to one of the ten curved treatment pods that circle an outdoor saltwater spa pool. I was asked whether I wanted my room flooded with sunlight or dim; curtains open, closed or somewhere in the middle. (Only in Los Cabos, which is sunny some 360 days of the year, would I ever opt for a couple of hours of shade). I fell in love with my very skilled technician who found every sore muscle (some I didn’t know I had) on my body and soothed them. Several times, she checked in with me with a whisper to make sure everything felt just right—and it did. It’s embarrassing to admit but I was so relaxed, she had to wake me when it was over. She slowly drew open the curtains and opened the door as I caught the sounds of running water and waves outside. I felt fully relaxed and invigorated. Healthy treats, digestive teas, and fruited waters waited for us outside a beautiful relaxation area with beds. Lying back on heaps of pillows, my friend and I lingered, chatting and laughing, hating the thought of leaving this special space but sure we would return again next year. After all, we had three more moons to go—and we hadn’t had time for a consultation with the curandera (spa guardian). A visit to this unique spa (designed by Sylvia Sepielli) is a great excuse to visit the resort. Arrive early to enjoy the indoor/outdoor spa facilities (there’s a beautiful sundeck with waterfalls outside the spa pool) and leave yourself time to visit one of the restaurants or the extraordinary gift shop that has been carefully curated with products from local artisans. It looks and sounds heavenly!! This sounds like MY kind of place – heavenly! The best is that you were able to actually fall asleep – the ultimate in relaxation. 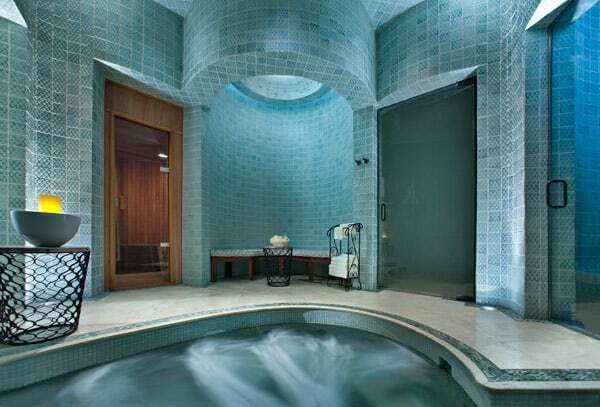 This spa looks gorgeous and luxurious. I felt myself relaxing and saying “aah” just reading your post. What a serene looking spa. Putting Capella Pedregal on the list if we get to Cabo San Lucas. I’m not much into spas – but this look pretty cool! I love the personal waterfalls above the rooms! I’m usually not a spa person myself, Michelle. This place was truly exceptional! Looks like an amazing place. Love how they include the elements in every step of the process. I don’t think I’d like having to be escorted everywhere. Don’t they do that in prisons? Of course, Capella Pedregal looks like a very nice place to be “confined”. On these sprawling grounds, it felt quite comfortable and nice to be escorted by warm staff who were eager to explain the property and its history. Sign me up! What an incredible place that I was not familiar with! You painted the perfect picture of architecture, pampering and elegance. I would love to go there. Thank you for sharing! The Capella Pedregal looks divine. We’ve eaten at the hotel’s El Farallon restaurant – and that was a gastronomic experience. No doubt the spa is equally wonderful (sounds like it is). I’m hoping that one day we will be in the same place at the same time, Janet. Perhaps in Los Cabos. Perhaps for a spa day together at Capella Pedregal? I love to be pampered and a spa is the only way to go. I so love the personalized rooms that don’t give the “locker room” impersonal feel. I probably shouldn’t have read this post today. A visit to the Spa at Capella Pedregal is exactly what I need right now, so it’s kind of like torture to look at the pics. But what a beautiful spot for some pampering. I wish I could be there now too, Cathy!